June 22, 2018, 1:08 p.m.
YouGov’s annual Groceries Code Adjudicator survey explores the improving relationship between suppliers and the biggest 10 supermarket retailers in the UK. The study indicates that while many suppliers still experience difficulties with retailers, generally speaking, action has been taken to improve the connection between brands and providers. 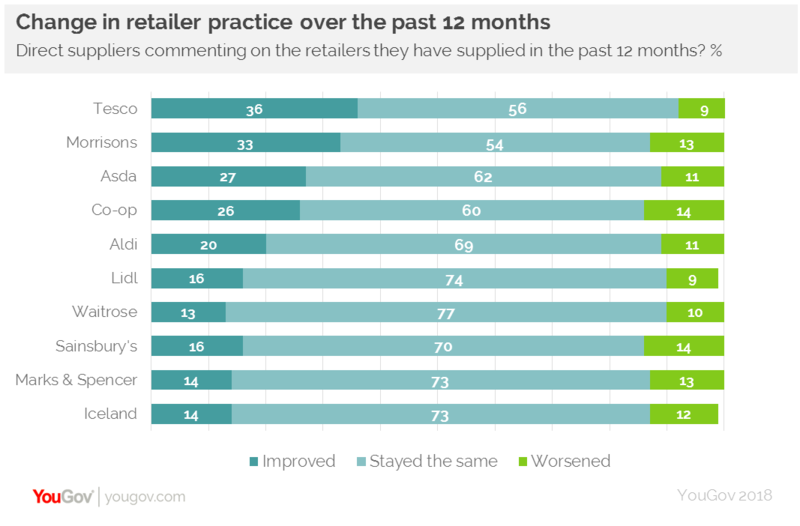 Though in the majority of cases, retailers feel that there has been no change in the practice of retailers, if we look at the net improvement scores (% that felt retailers have improved, minus % that said it had worsened), all major supermarkets have a positive net rating. Tesco is seen as the retailer which has improved the most. While over half of suppliers say Tesco’s practice has stayed the same, 36% say it has improved, against 9% that believe it has worsened. Morrisons follows closely behind, with 33% of suppliers stating it has improved. Supermarkets are seen to be complying with the code ‘consistently well’ or ‘mostly’. A small minority say that supermarkets are complying rarely or never at all. In all but two cases, supermarkets’ 2018 ‘consistently well’ score is higher than it was in 2017. Similarly, suppliers generally believe trading relationships are conducted in good faith and with duress. On this measure, Aldi is the top retailer, with 43% of its suppliers strongly agreeing that it does so. Problems do still exist. Our research shows that 43% of suppliers experienced a Code related issue in the last year. Of this group, 19% experienced a delay in payments, 17% received no compensation for forecasting errors while 13% said retailers did not meet duties relating to de-listing. The overall trend is however positive given that in 2014 as many as 79% of suppliers experienced a Code related issue.